[img]http://biologic.xyz/downloads/images/filepaircheckscreenshot_thumb.png[/img] is not a valid Image. 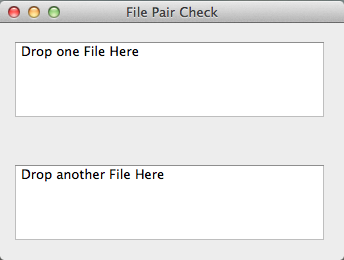 This simple drag and drop utility checks if two files are identical. It does not check bundles or whole folders recursively. Such items need to be archived (e.g. zipped) before comparison. File Pair Check is a user-friendly front end for the SHA-256 Unix checksum utility. Useful to tell if a copy is true to the original, or if changes occurred between two versions of a file. Also helps remove duplicates.